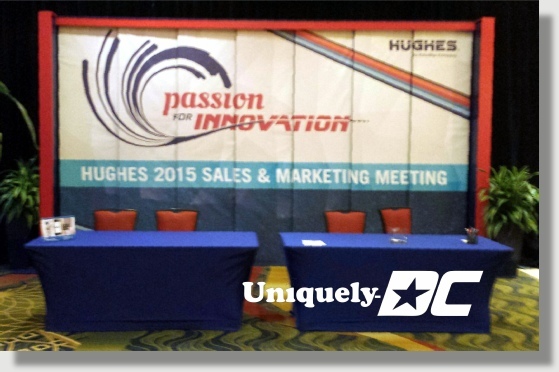 ﻿ Uniquely DC produces Business Meetings, General Sessions, Plenary Sessions in Washington DC, Mayrland and Baltimore. 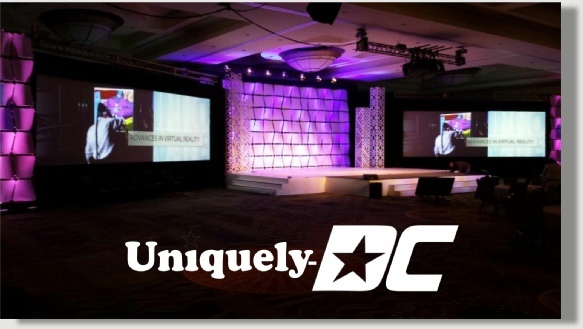 The Uniquely DC, Washington DC Special Events Production Team is based in the the Washington, DC Metro area and regularly services the District of Columbia, Baltimore, Maryland and Virginia markets with high quality convention and meeting services. We know meeting production in the USA!.. From the 15' x 32' hard screen surrounds, to the towering 17' high Super Columns and Waffle walls - this stage presentation was surely set to dazzle. The lighting and video projection on the waffle walls was quite impressive as was the high gloss white stage, stairs and skirting we prepared. Click HERE to invite us to build your next meeting set. 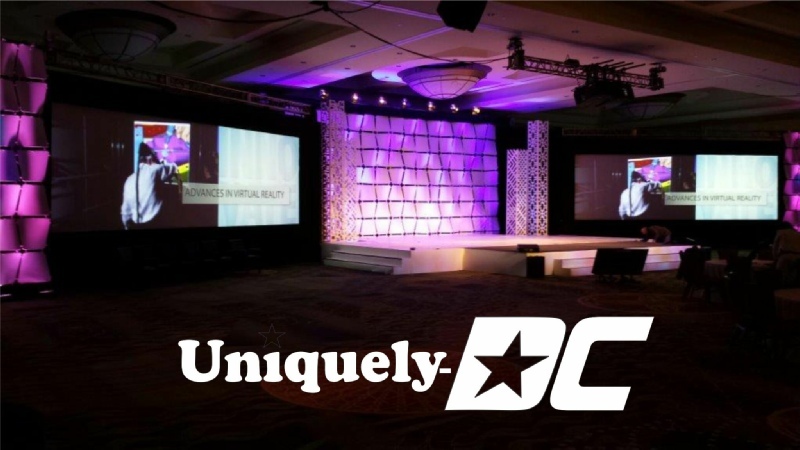 Uniquely-DC produced all the custom scenic for TalkingTree Creative's Producer - Craig Weisbaum as part of the annual Hughes meeting at the Marriott Bethesda North Conference Center. 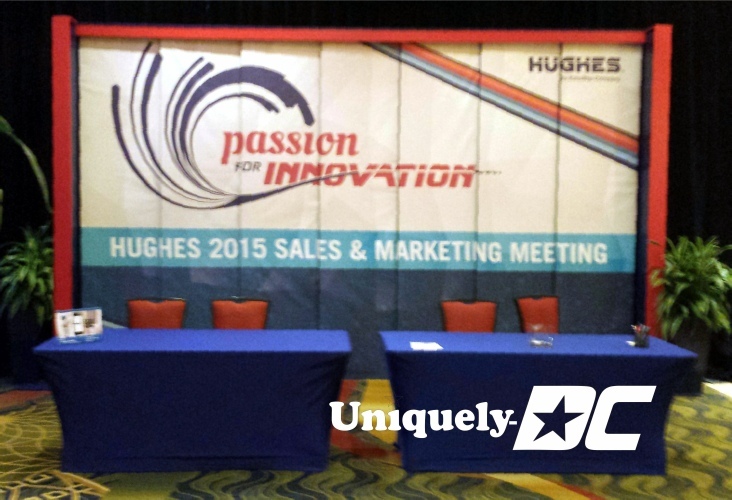 Uniquely-DC also fabricated a pair LED lit Glow counters for this meeting. The front of each has a gentle bow and can wirelessly be be programmed to create the look you desire. Two more are being built as part of a Central 4-sided Bar unit for an upcoming themed event in March. Watch for more photos and book your event now. This photo also gives you a nice look at video projection on the waffle wall and the high gloss white stage flooring. Trust your custom event production to a company with a team of industry pros who have 30 years of continuous service in the special events and meeting production industry. 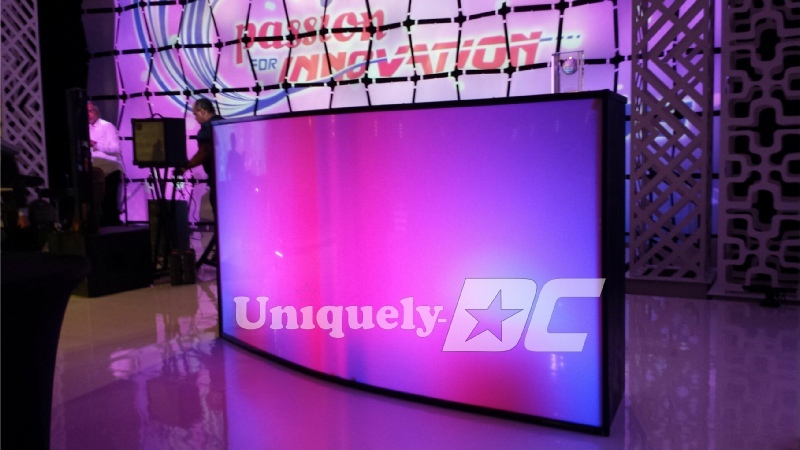 Uniquely DC will provide you and your guests with high quality fabrication that your guests and meeting attendees will long remember. 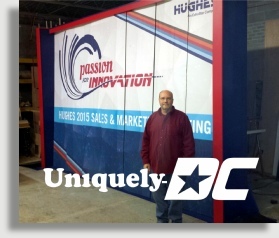 Big Registration - this is a great new registration and banner hanging scenic piece fabricated in January. 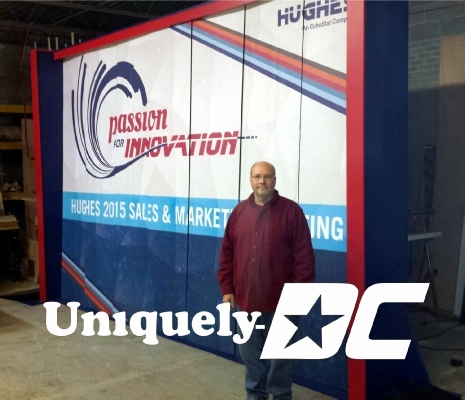 This registration backdrop towers to just over 10' in height and has an overall length of 18'. Our printer worked overtime "knocking this one out of the park"! Each printed blind was mounted on 10' tall wooden panels to maintain the integrity of the look. The client's message and location could easily be seen from over 100' away. 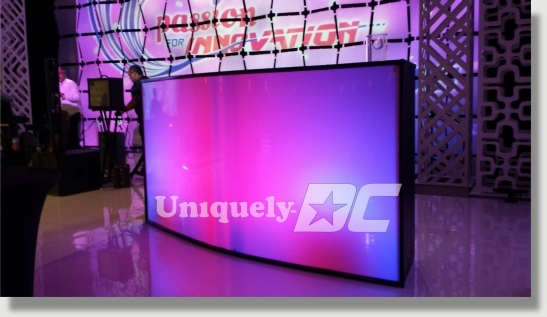 This unit will also quickly hang and support 10' x 16' banners on stage, outdoors or in an exhibit hall. There are a lot of uses for this piece which sets up in about 10 minutes. 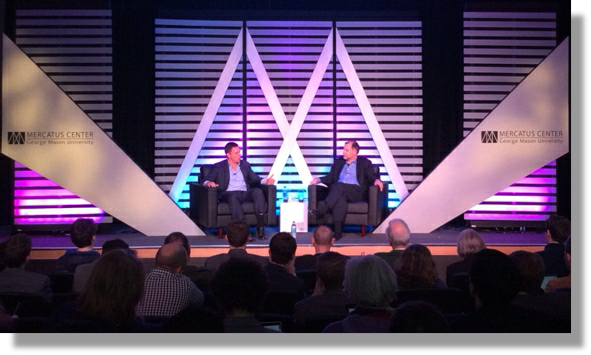 Uniquely-DC designed and installed the “M” set for “Conversations with Tyler” - a high profile interview and webcast series that is returning in the fall. This dynamic stage set is available for business meetings throughout the Washington DC area - lights extremely well and covers a 32’ wide stage nicely. Uniquely-DC produces the annual World Vaccine Congress. Our team implemented and managed all the audio visual services and stage scenic as part of this annual event. 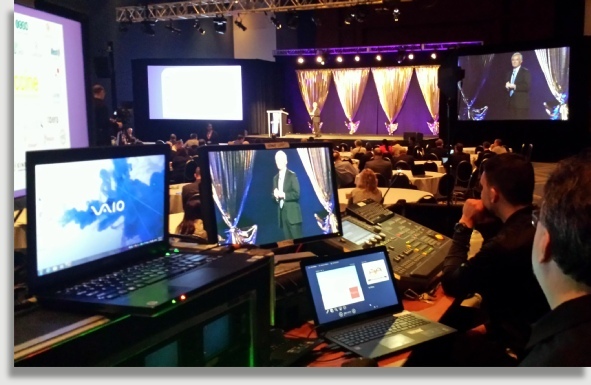 A talented team of technicians made the execution of speaker sessions a flawless event.